Wang Shi Tong was an important master of Ba Gua Zhang who is unfortunately little known outside of Beijing. Even in old age, with an unsteady gait, his power and skill level shone through, revealing a high level of skill and a deep understanding of the art. Though my own time with him was short and spread over several trips to Beijing, he imparted much. Wang Shi Tong was a disciple of Guo Gu Min and Li Zi Ming. Guo was a disciple of Liang Zhen Pu as well as a student of Liu De Kuan (also a disciple of Dong). Liu De Kuan was the creator of the 64 linear palms that are taught in the Liang style. 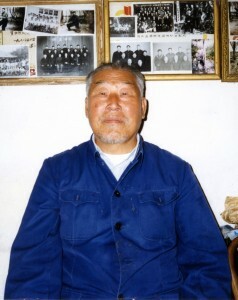 Guo was also the senior school brother of Li Zi Ming. 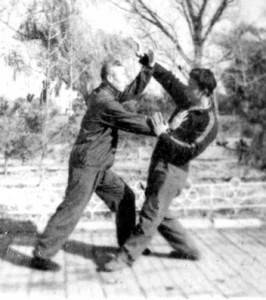 Although he learned many martial arts, including Xing Yi Quan and Tai Ji Quan, Wang Shi Tong devoted himself to practicing Liang Zhen Pu Ba Gua, particularly the eight linear single movements, the 64 Hands, Lao Ba Zhang (Old Eight Palms) and Ba Mien Zhang (Eight Direction Palms). Wang felt that these forms contained only practical movements, every movement having specific applications. Wang told me that Liang Zhen Pu’s Ba Gua was extremely practical without the flowery movements that characterized other styles. Guo Ge Min’s teachings focused on practicality and application. 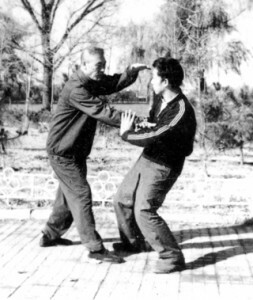 Wang then proceeded to demonstrate simple direct applications for each of the 64 movements in Ba Mian Zhang. Even Wang’s weapons forms were practical rather than flashy. He had me demonstrate a Ba Gua broadsword form I had learned previously. His comment: “not bad, but too flowery.” Then he unveiled his sword work as he had learned it from Guo. His 64 Broadsword form contained only movements that were direct and to the point. In many ways it resembled the Filipino arts I had learned earlier. When I met him in 1994, he had difficulty walking due to a head injury, but his enthusiasm for Ba Gua remained undiminished. 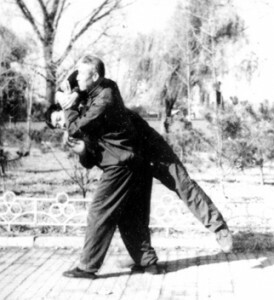 Wang could still demonstrate the practical applications of each movement and his power and body connection were evident as he threw me around our small hotel room. Demonstrating fine points of attack and defense, the efficiency of the movements and their deceptive angles, appearing to attack one place while striking another, never ceased to bring a big smile to his face. Wang passed away in 2005 after a long and incapacitating illness. All of us who practice his forms owe him much. Wang’s favorite form was Ba Mian Zhang (八卦游身八面势掌 Ba Gua You Shen Ba Mian Shi Zhang) – The Swimming Body Eight Facing Pattern Palm. Wang felt that this form combined all of Ba Guas’s unique elements in one package. Wang showed specific applications for each move and delighted in demonstrating the deceptive curving hand strikes, subtle throws and off-balancing maneuvers. 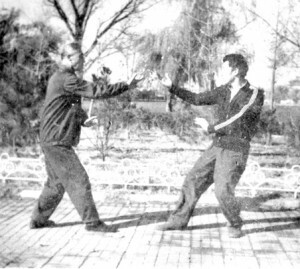 In the photos that follow, Wang Shi Tong demonstrates his applications for the first line of the 64 hands – the straight line methods of Liang Zhen Pu Ba Gua Zhang. Wang pierces with his right hand. 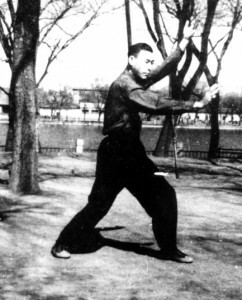 As it is met by the opponents right hand, Wang pierces with his left hand and steps in, converting the left piercing palm to an uplifting palm while striking with the right palm. The opponent counters with his left hand. Wang moves to the outside and turns his hands like rolling a ball to trap and poke the eyes. When the opponent moves to counter the poke, Wang slips around his arm with a wrapping motion and delivers a downward twisting punch as he moves forward. 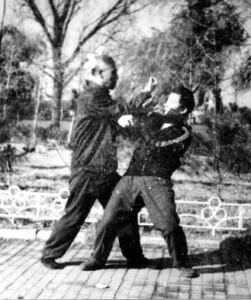 As the opponent defends with his left hand, Wang controls him with his right hand as he changes his steps, emptying the right side of his body and pinning with the left hand as he strikes high with a right twisting punch. 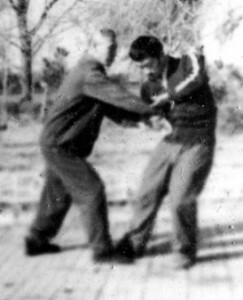 Forced to defend the high punch with his left hand, the opponent rises his left arm, slightly allowing Wang to get behind his elbow and drill upward with his left, off-balancing the opponent, as he punches underneath with his right. The opponent manages to cover up and smother the lift and strike, but Wang moves in again. 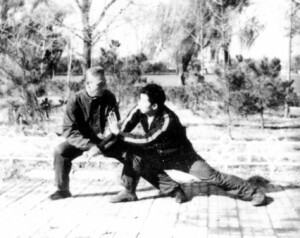 Wang’s left hand presses down covering the opponents arms as he splits over the top with his right fist. 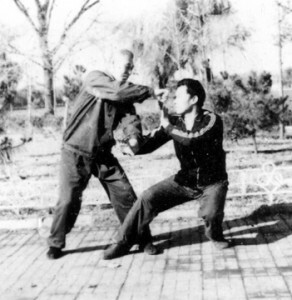 The opponent lifts his right arm to stop the splitting strike and Wang steps back and drops his body, using his right arm to lead and guide the opponent, as he files and presses the opponent’s elbow with his left hand. 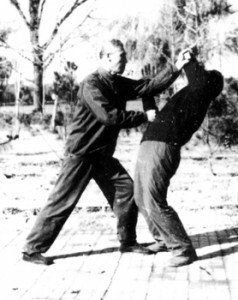 When the opponent uses his left hand to remove Wang’s filing and pressing arm, Wang traps his left hand and steps forward and turns abruptly, simultaneously using his right elbow to entangle cut, lift and drop the opponent, throwing him to the ground.